The Sony Xperia Z is the Japanese phone-makers flagship device for 2013. The Android 4.1 handset is water resistant and boasts a 5-inch 1080p full HD touchscreen, a quad-core Snapdragon S4 Pro, and NFC. A 13 megapixel camera with the usual Sony refinements and 4G LTE round out the offering. 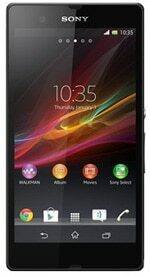 The Sony Xperia Z was announced at the CES in January 2013 and is now shipping.